Iron Fist is a Perk in Fallout 4. It is associated with the Strength Stat. Rank 1: Channel your chi to unleash devastating fury! 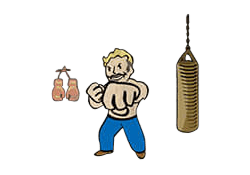 Punching attacks do 20% more damage to your opponent. Rank 2: Punching attacks now do 40% and can disarm your opponent. Rank 3: Punching attacks now do 60% more damage. Unarmed Power Attacks have a chance to cripple one of your opponent's limbs. Rank 4: Punching attacks now do 80%. Unarmed Power Attacks have an increased chance to cripple one of your opponent's limbs.